MANILA, Philippines - Militant groups called the recent anointment of Interior Secretary Mar Roxas as successor of President Noynoy Aquino “logical choice for a laki-sa-layaw, pompous son of sugar haciendero of a president to prefer his kindred spirit,” albeit a formal declaration from their political party. “As far as the workers are concerned with the affairs of the country, Aquino’s choice did not come as a surprise. 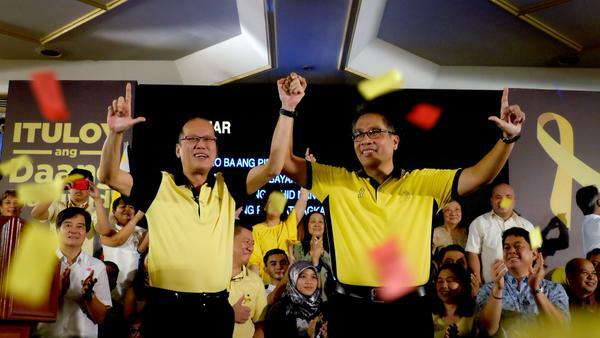 Aquino did not hide the fact that he desired a candidate who will continue his rabid anti-poor policies and Roxas undeniably fits the bill,” said Leody de Guzman, chair of militant labor group, Bukluran ng Manggagawang Pilipino (BMP). The BMP views Roxas’ acceptance of the baton from Aquino not only as a continuation of the programs of Aquino that led to wage suppression, widespread underemployment, contractualization and circumvention of labor laws but also their furtherance. De Guzman argued that, “Roxas’ banking and business background will be utilized to stir up foreign investments and will directly translate to relentless liberalization of the market, deregulation of strategic industries, privatization of state assets and labor flexibilization”. More so the labor leader perceives that Aquino’s endorsement of Roxas will not only serve in the interests of the oligarchs but is also self-serving for it assures him a free pass from all accountabilities for his administration’s transgressions. “Roxas’ neo-liberal economic stance and entry in the 2016 presidential race has placed him in the crosshairs of the workers’ rage. He should expect it anytime soon, he added. Meanwhile Atty. Aaron Pedrosa of Sanlakas took a jab at the public event at Club Filipino were Aquino announced his anointment of Roxas saying that, “it was composed of the same old dynasties and personalities that benefitted from the Aquino regime and aim to perpetuate their economic and political control from 2016 onwards”. “It only took less than a week for Aquino to expose himself. This administration never intended to pass the anti-dynasty law for it is the lifeline of their elitist rule and their activity at Club Filipino is testament to that. Roxas’ campaign shall be fueled by these corrupt dynasties, he said. Both groups vowed to oppose all presidential candidates that will bear the neo-liberal economic agenda in their political platform.